Green Island, NY - Rock Krawler Suspension is proud to be the first to bring JK coil over systems and JK coil over stretch systems to market. Rock Krawler truly is the suspension leader for the JK market! The first system is the Rock Krawler Comp 55 Long Arm System for both 2 doors and 4 doors. The sku number is rkjkcomp55. -Massive 12" Travel Coil Over Shocks up Front. -The Best off Camber Ability of any System on the Market. 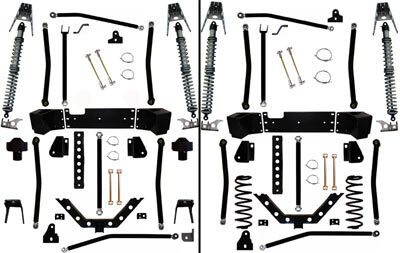 The second system is the Rock Krawler Comp 55 Long Arm Stretch System for both 2 door Wrangler JK's. The sku number is rkjkcomp55-stretch. -Wheel Base Stretched to 104". -The Best Vertical Climbing Ability of any System for 2 Door JK's. -Bolt In Rear Coil Spring Relocation Brackets.